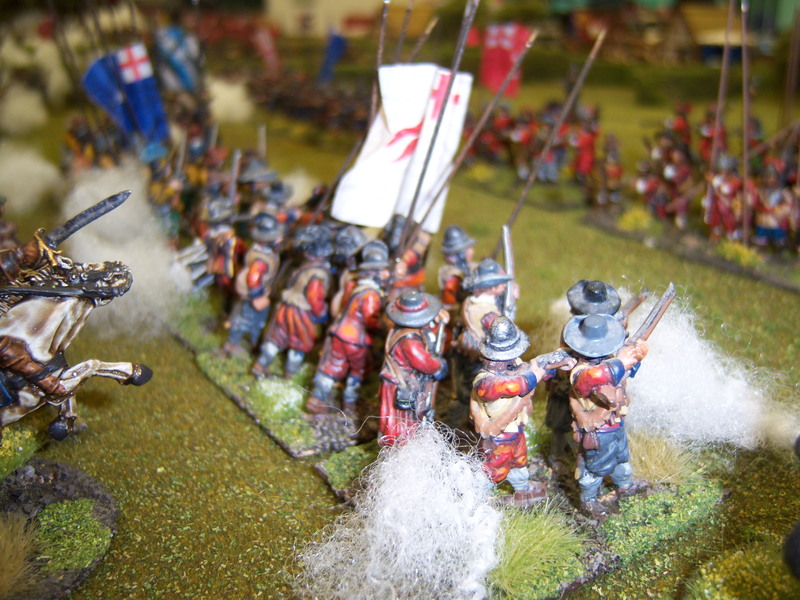 It has been a long time, over 2 tears since we have played an English Civil War game. I don’t now why either. Over the last month I have been writing a new set of rules for the period, that follows the same format as our other rule sets. This was to be the first test play of them. 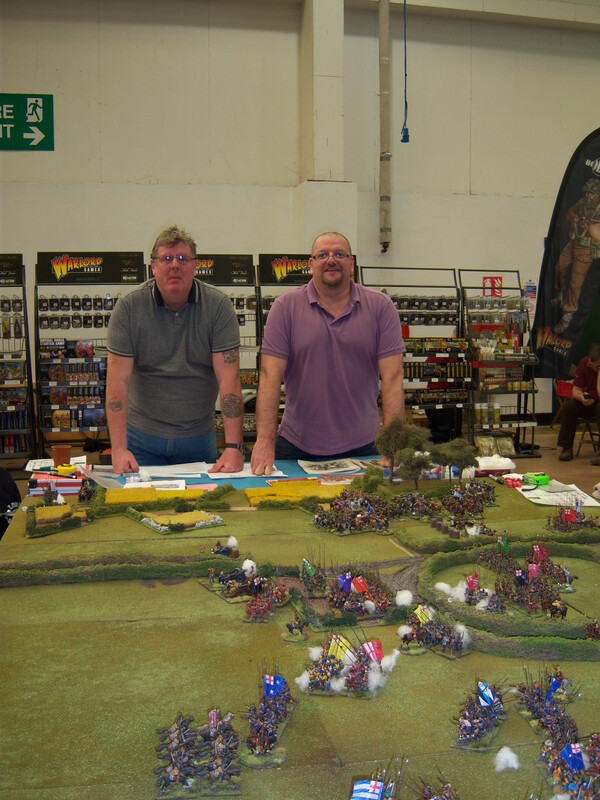 I have to admit I think they played well and the two players Laurie and Stephen enjoyed the game and picked up the core ideal of the rules in a few turns. I won’t talk about the rules now but will upload them soon for you to have a look at. The game was a pretty balanced affair. 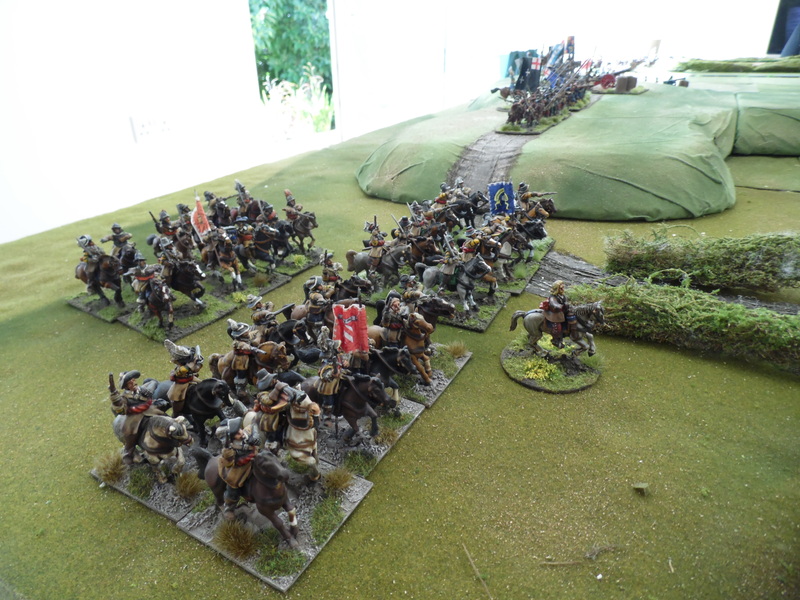 Setup was traditional, 2 cavalry wings and infantry in the centre. 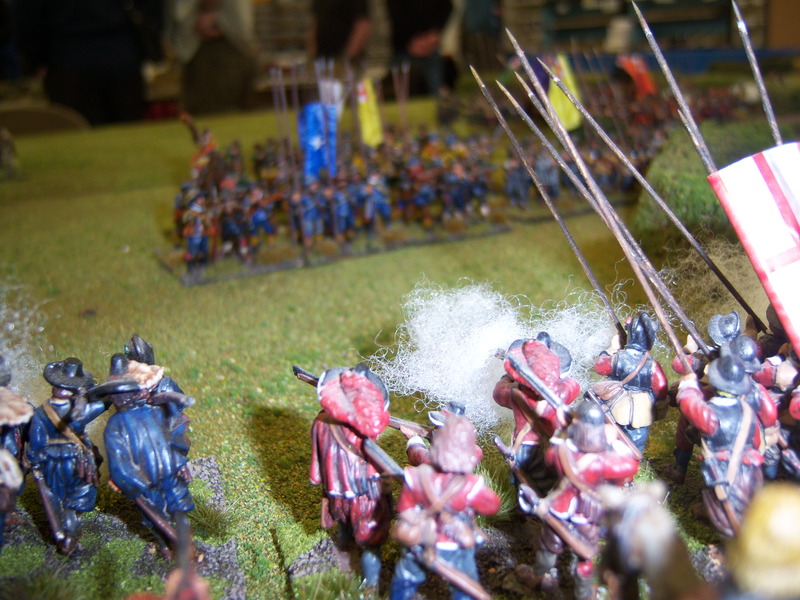 Both sides opened up with artillery fire and first blood to the Parliamentarians as they inflicted a casualty on a Royalist foot unit in their centre who never having been under artillery fire before, failed their morale and became shaken. With the confidence of this the Parliamentarian centre started off across the centre ground to meet the opposing Royalist foot. 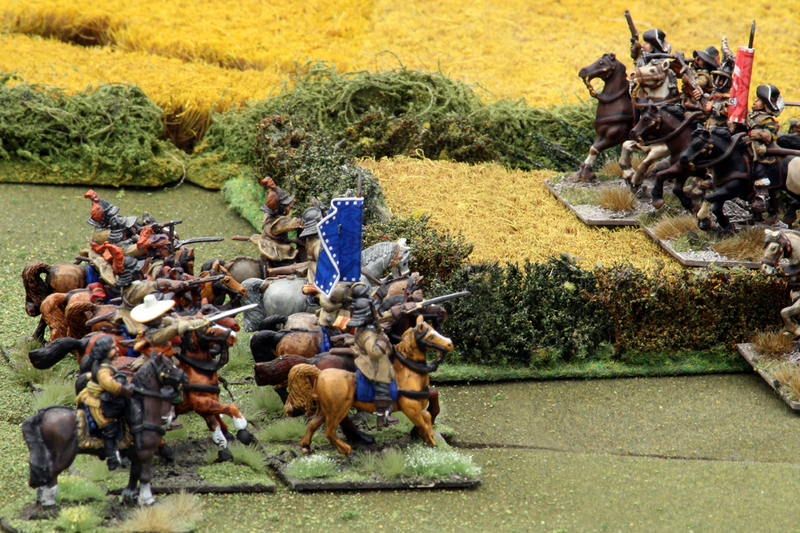 The left hand Royalist cavalry traded harsh glares at the Parliamentarians opposite, neither wishing to advance into the crops and possibly be caught at a disadvantage. 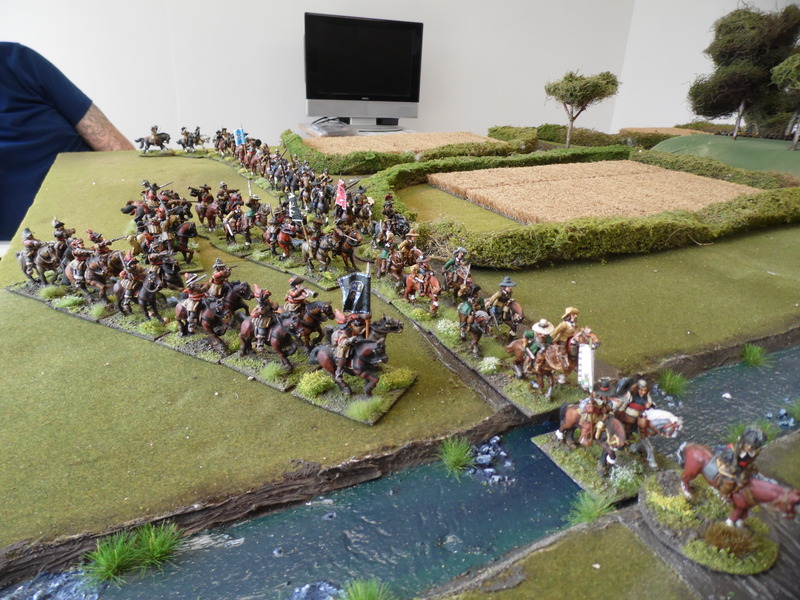 Over on the right flank Sir Byron was more than happy to take his Royalist cavalry across the open terrain and have a go at the Parliamentarian upstarts opposite. Over the next couple of turns they closed in on each other. Both players soon started to realise that to get a plan to work you need to build that plan around your commanders’ abilities and ensure you have them in the right places at the right time. I think the Royalists(Laurie) sussed this out a few turns below the Parliamentarians( Stephen). 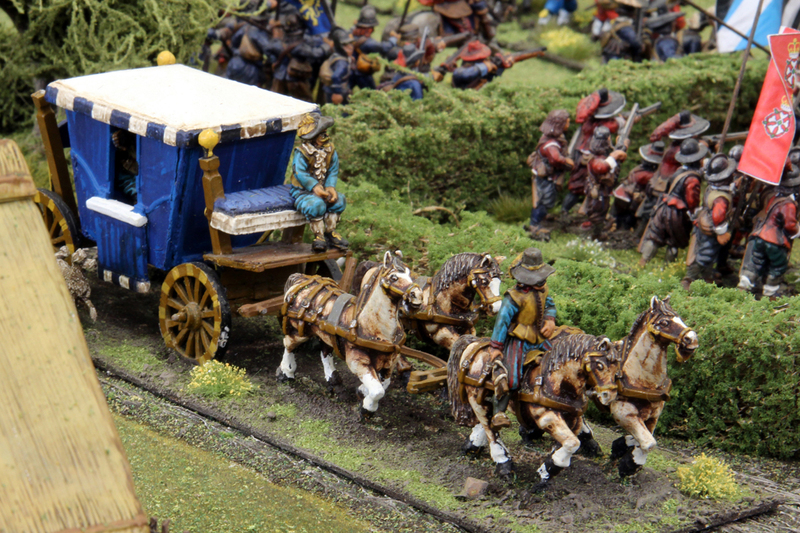 What bought it home to them was that by having your commanders in the correct locations Laurie managed to activate his right cavalry wing three times in a turn( Initially activated by Rupert, then by Lord Wilmot and finally Sir Byron). 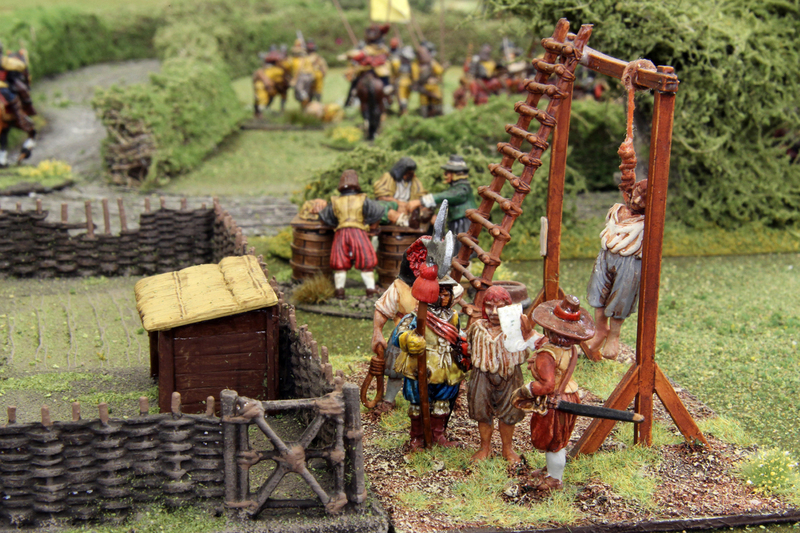 This enabled the Royalists to engage the Parliamentarian cavalry with their and fight two rounds of melee (Not all going their way). this turned out to be an epic stage of the battle as both sides traded blows and won and lost ground. 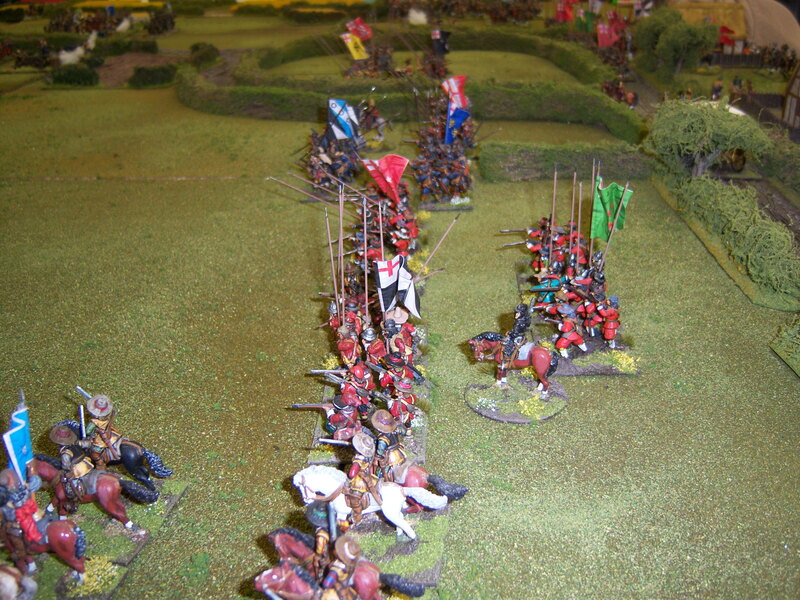 A Parliamentarian unit had broken and unfortunately decided that they had done their fair share and routed, heading for their table edge. 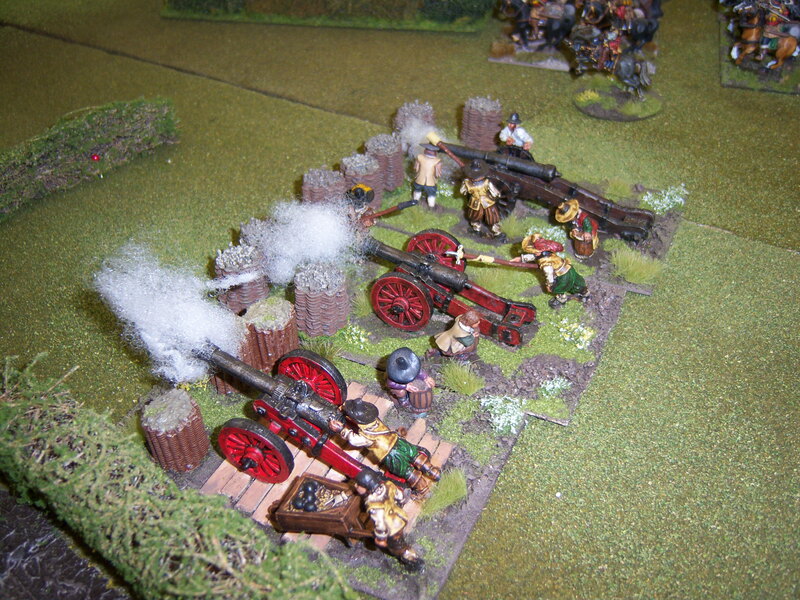 The Royalists had also lost a unit to artillery fire. 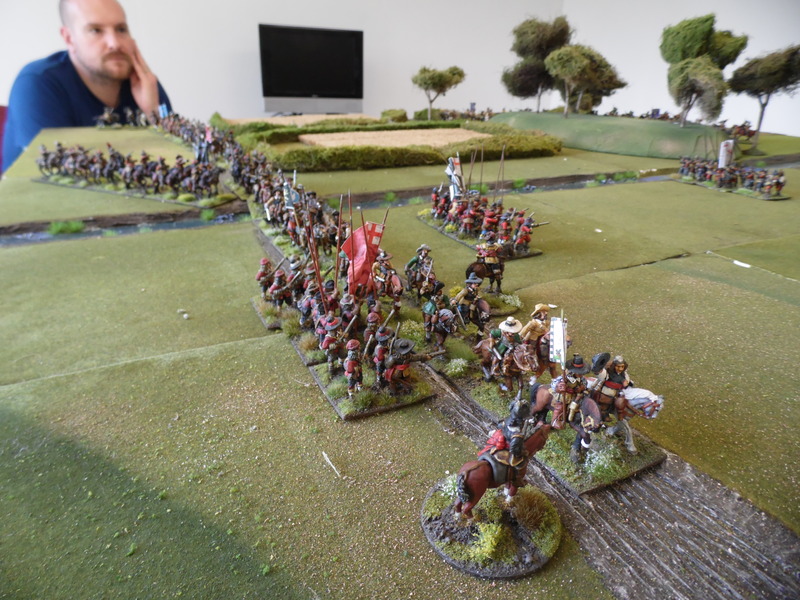 It was at this point that Stephen realised that his commanders where probably not quite up to the standards of the Royalist commanders and due to the poorer command ranges he was not getting as many activations as he would have liked. 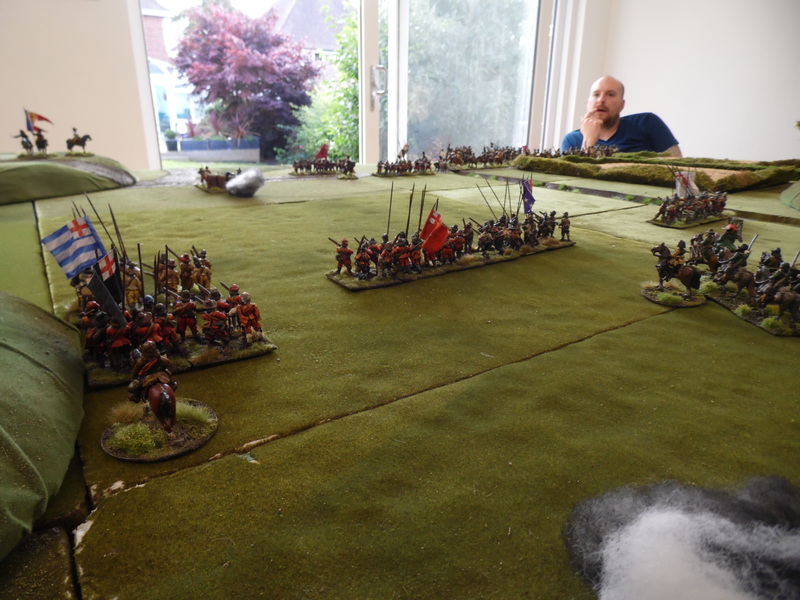 Laurie was feeling confident on his right wing and decide to bridge the gap in his centre with his left flank cavalry. 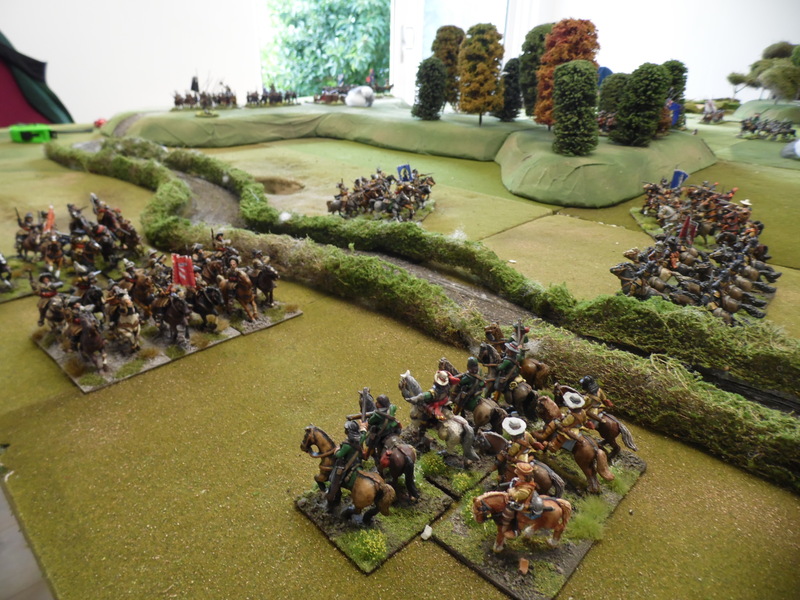 He started to bring them over the ford and towards the centre. This caused a huge traffic jam at the ford as units started to block other units and this in turn resulted in many activations being wasted. 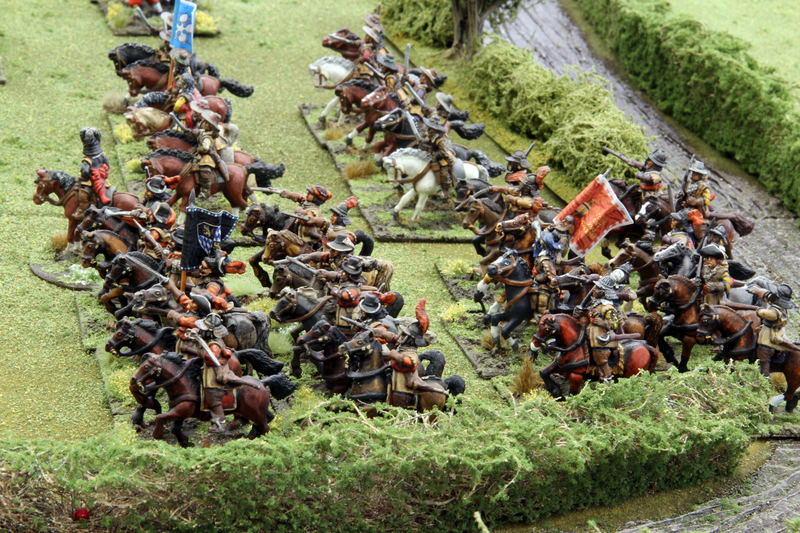 Having seen this happen the Parliamentarians decide to advance with their right wing cavalry towards the now sparsely occupied Royalist left. This was however hampered by the terrain and lack of command! 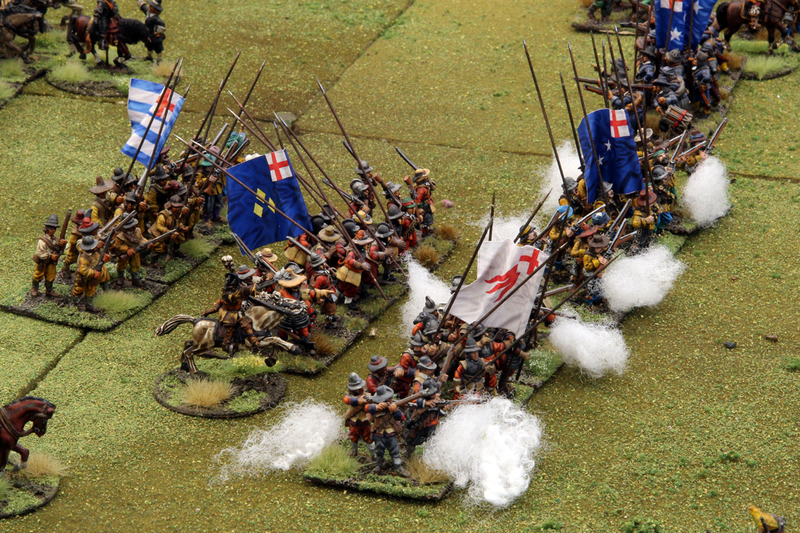 The right wing Royalist cavalry got to grips with each other. 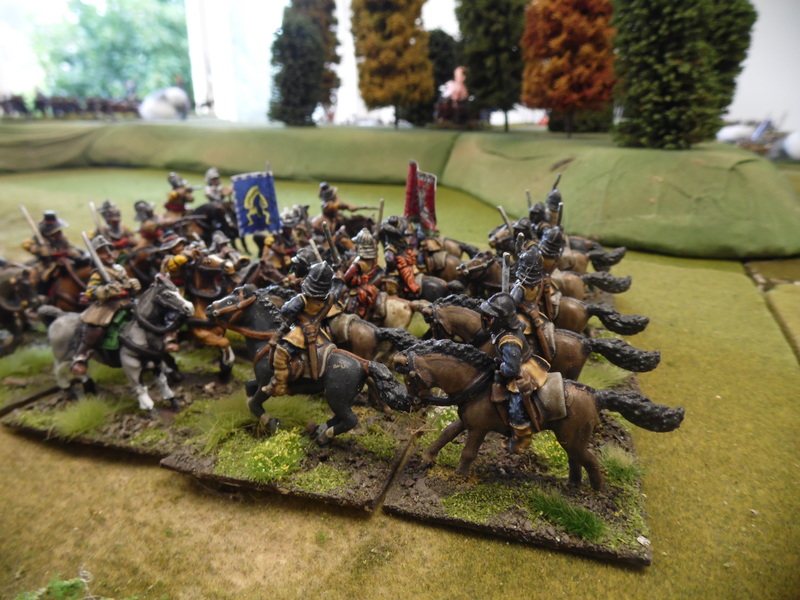 The melees carried on for a few turns until finally Laurie managed to reinforce a melee with a second unit causing the utter defeat of the last Parliamentarian cavalry unit of their left. 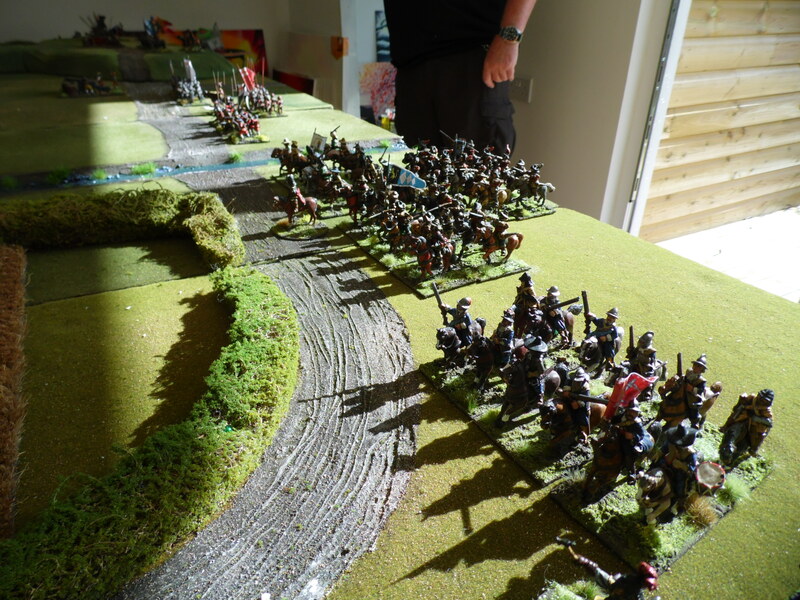 The centre was open as the only thing now stopping the cavalry swinging around to hit the centre was the routing Parliamentarian unit. Stephen tried desperately to rally them, hoping to plug the gap. 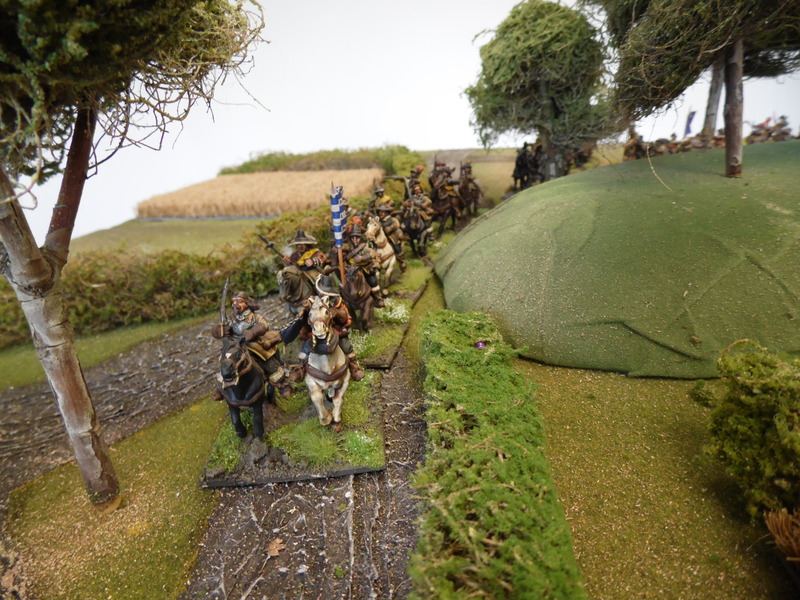 Unfortunately the Royalist left wing were now in the centre field and engaging the foot who attempted to fire on the charging cavalry but did not have time for accurate fire and caused no damage to the incoming cavalry. The result was final. Everybody said they enjoyed it and the rules for the most part seemed to play right. 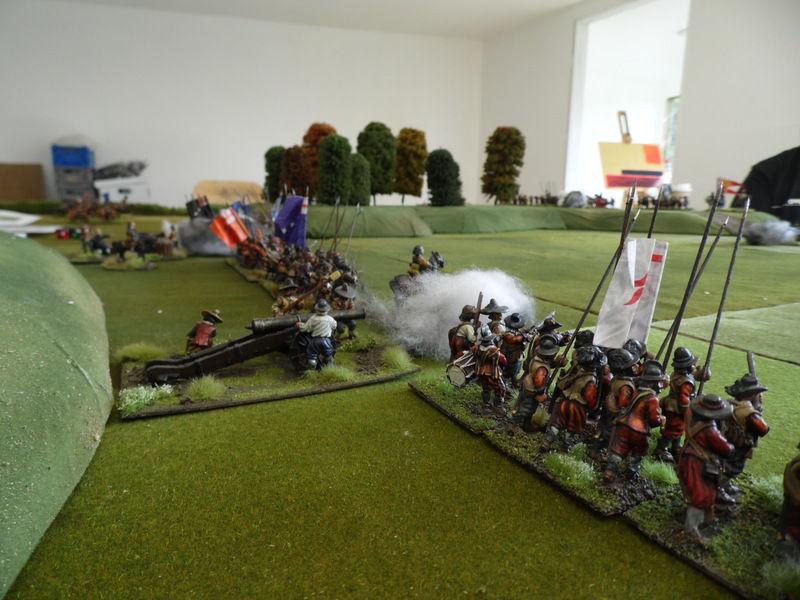 In the meantime before the rules are uploaded here are some pictures of the game. All are from my collection and are mostly Redought with a few Front Rank and Foundry. Parliamentarian left Wing. 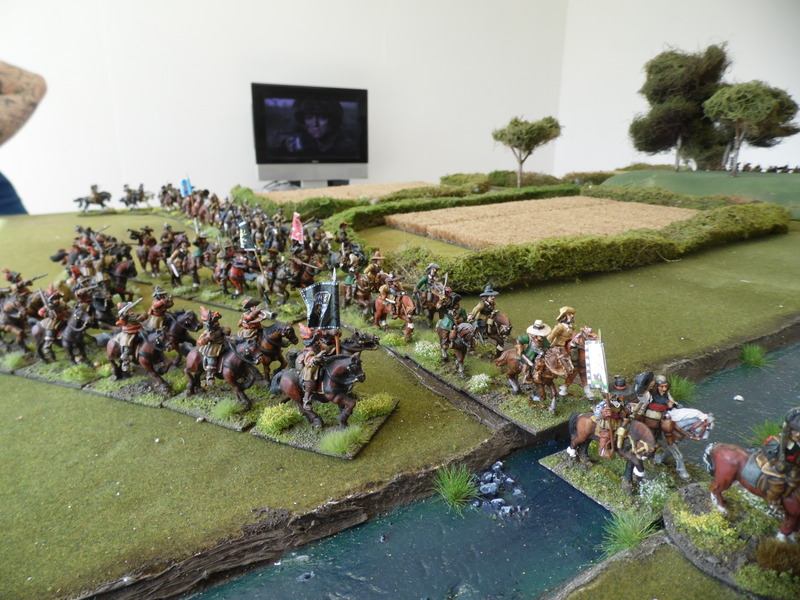 View of the impending large cavalry engagement from the Parliamentarians view point. 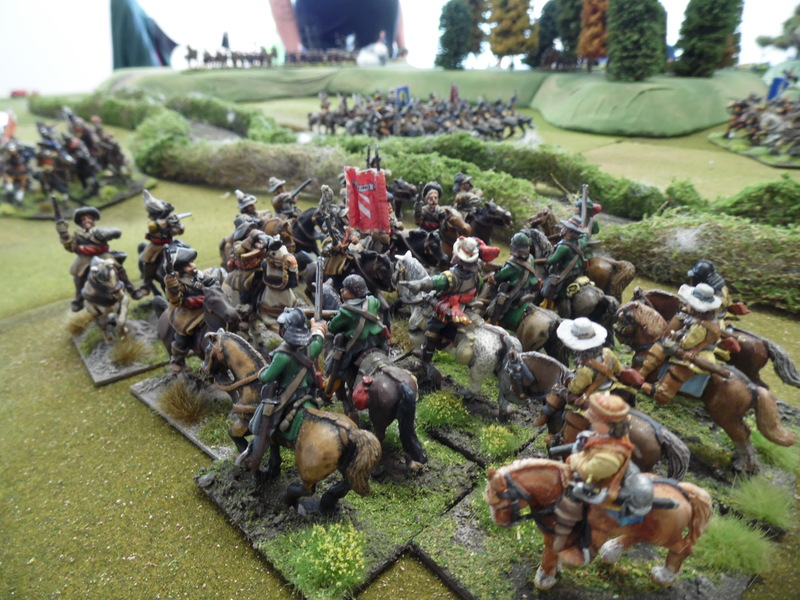 The on going cavalry clash with Royalist reserves waiting to join the melee. 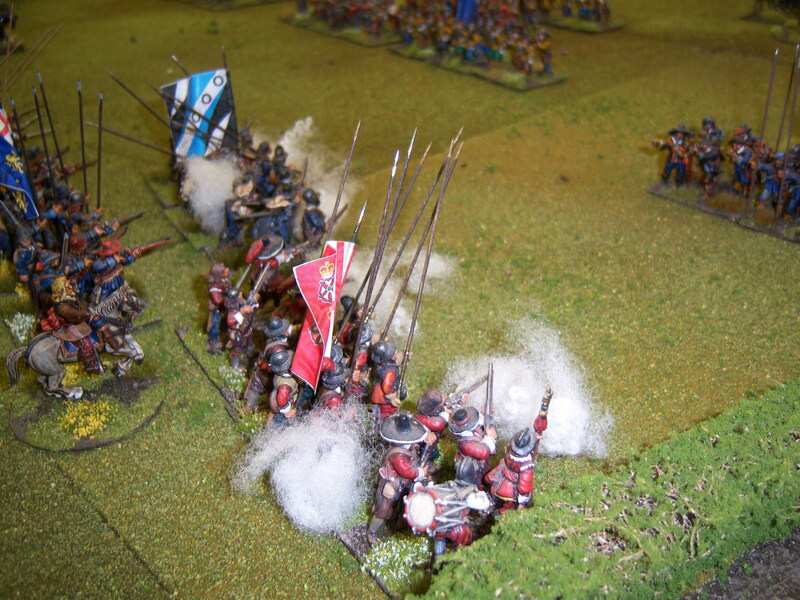 Parliamentarian right wing cav start to advance unfortunately too late to save the day. 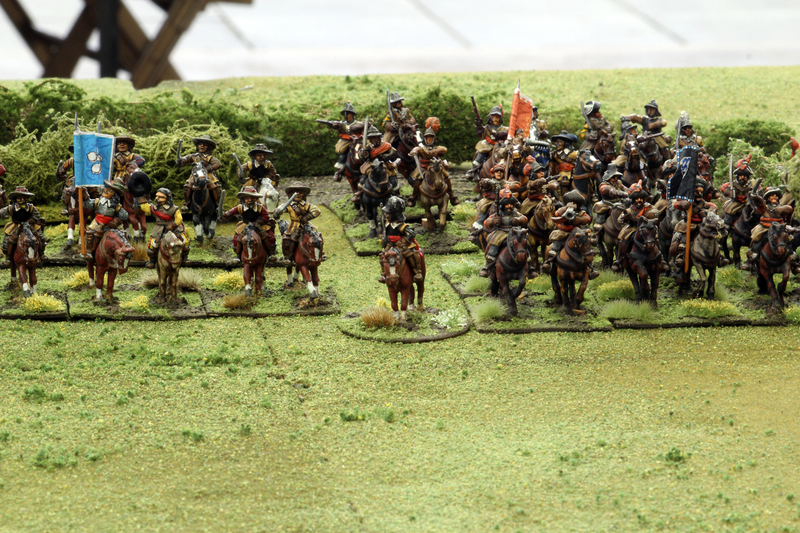 Royalist cav now in the centre engage the parliamentarian foot. Final nail in the Parliamentarian coffin. 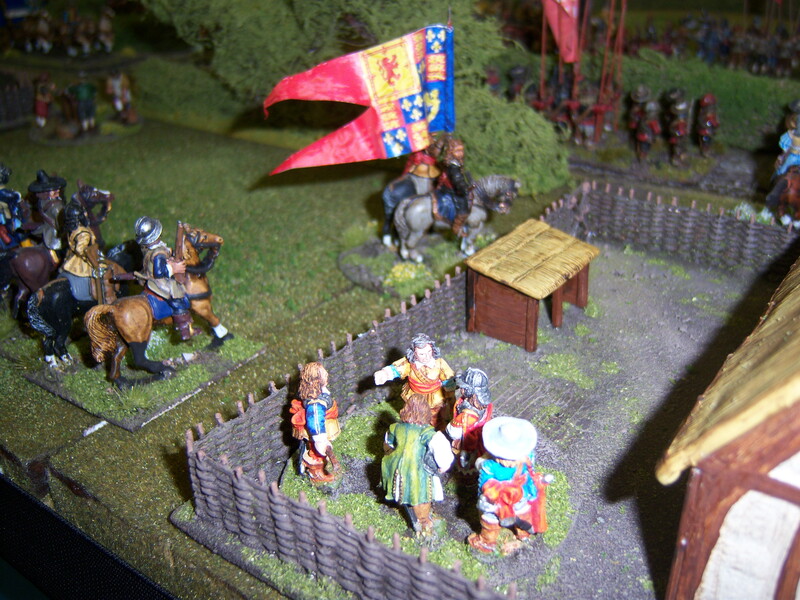 The Royalist cavalry in the centre break the Parliamentarian foot. 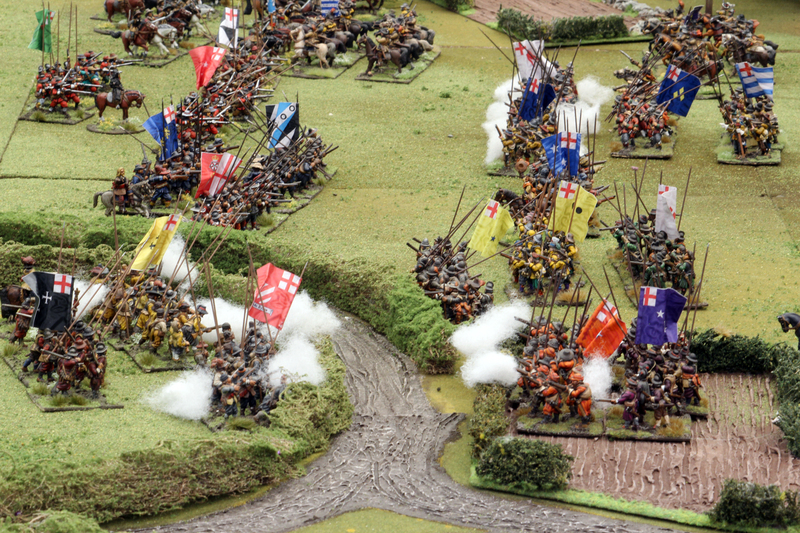 Thank you to all of you that voted on what game you would like to see at Legionary 2014. 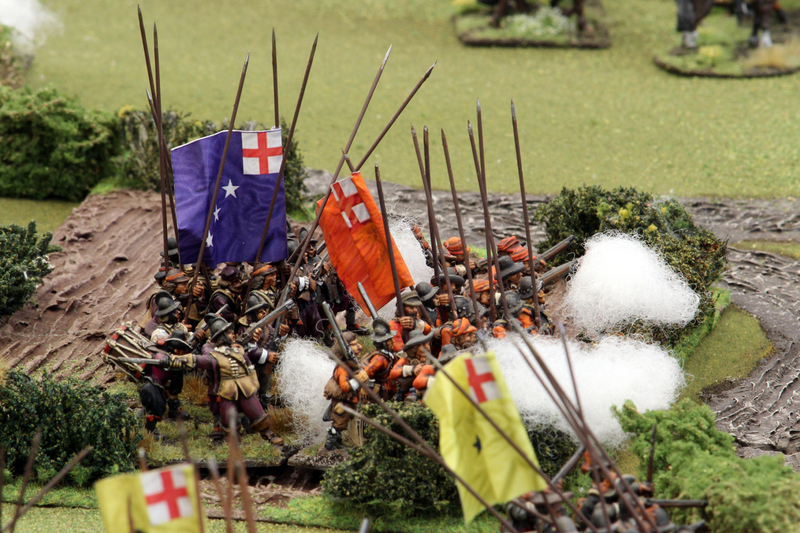 3rd Scottish Wars of Independence – this jumped from 5th to 3rd in the last week. I will do a little more data review and let you know what your most popular scales and eras are. 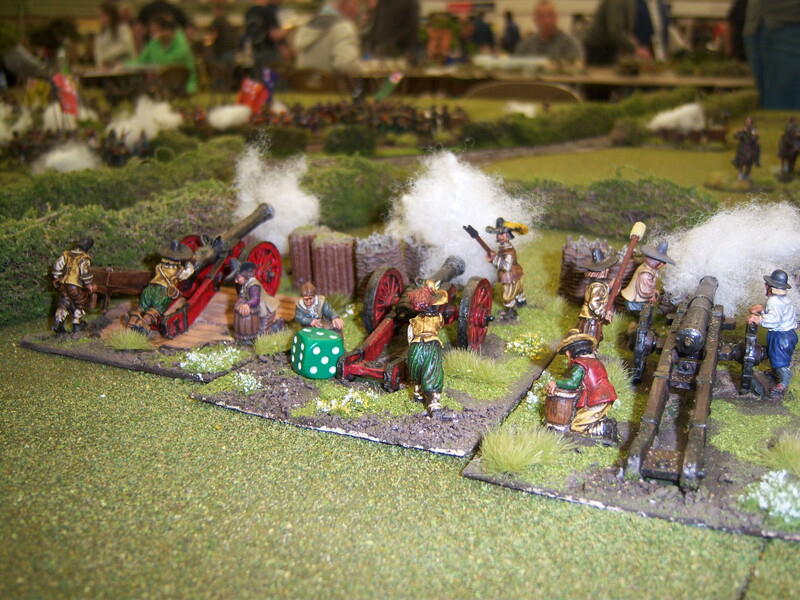 I am currently struggling to decide which game to build for next year’s Legionary Show in Exeter. As I am new to blogging I thought it might be an idea to ask for your views. With that in mind I have created a simple questionnaire. I am also hoping to have a few spare playing places for the game so if you can come along, please fill in your details at the end of the questionnaire. I will keep the questionnaire open until the end of July. As promised a while ago, here are the QRF I made up. I know the rules are only a few pages long but when playing it does make it easier to find obscure bonuses etc. that are described in the passages rather than the tables. We have made a couple of changes to some distances, but you can alter these back if you wish. 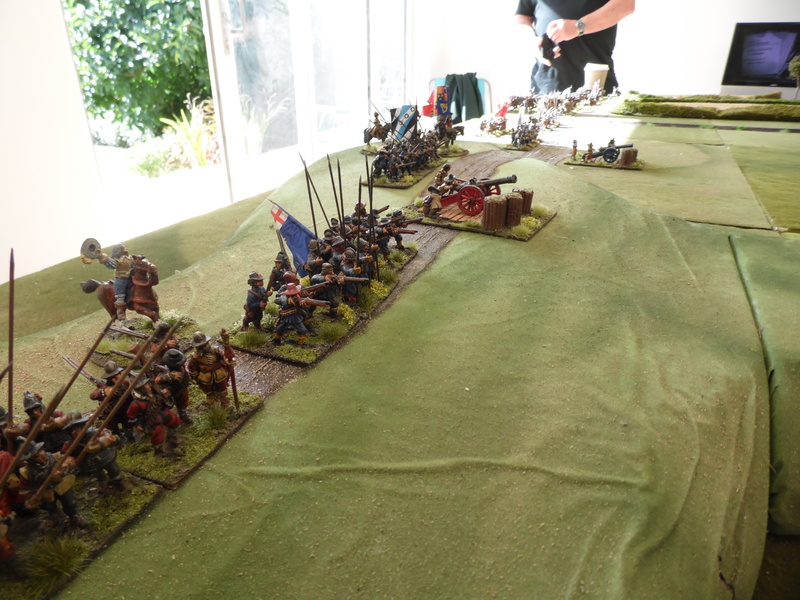 Saturday the 4th May arrived and fully loaded up we went to Legionary. The venue is great, plenty of free car parking only feet from the entrance. More importantly it had a café on site which was serving hot food from 8am. Great food and great value. We had reserved a 10’x6′ table. 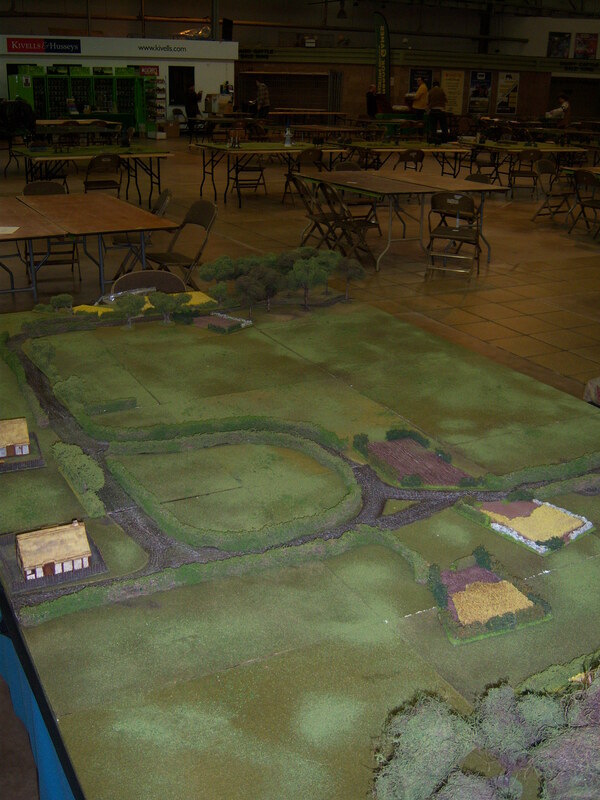 This would be the first time we had seen the table set up fully as my wargame table is 9’x6′. We were one of the first to arrive. 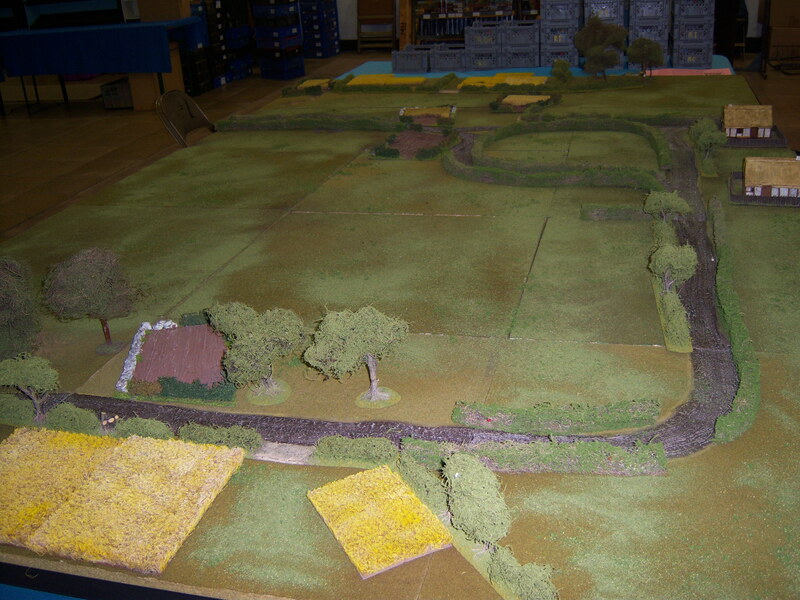 The boards are TSS with our own roads styled on to them. A lot of people commented on the trees so maybe I will make a few more and show you how to do it on a later blog. 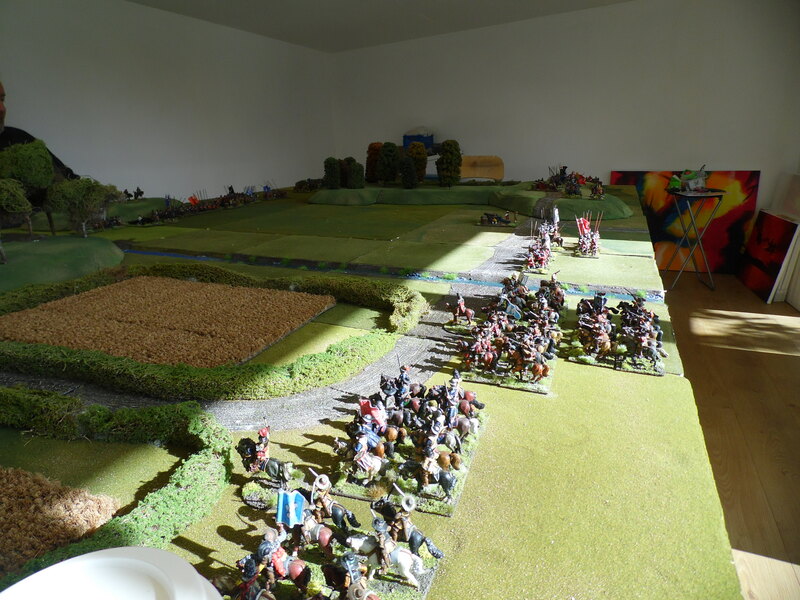 All the troops were then placed. The game got off to a nervous start on both sides. 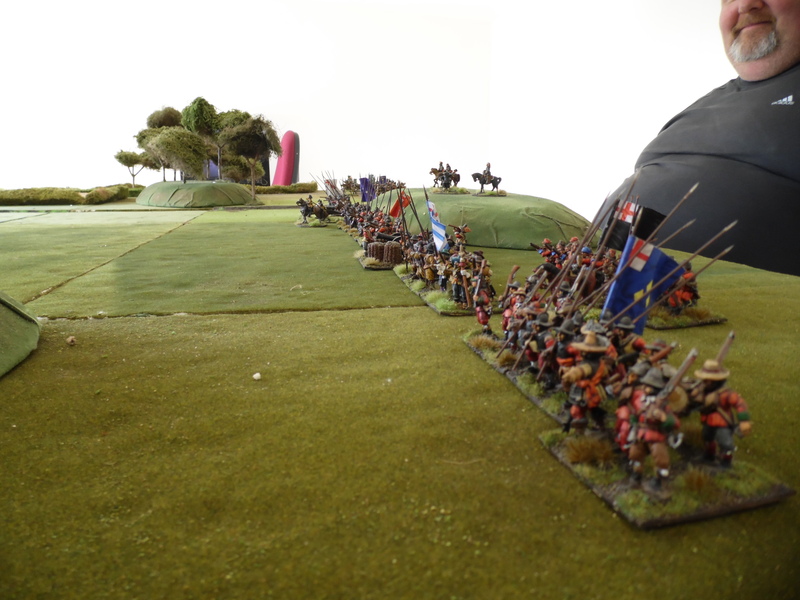 The Royalists deciding to try and hold the centre by moving their infantry forward. 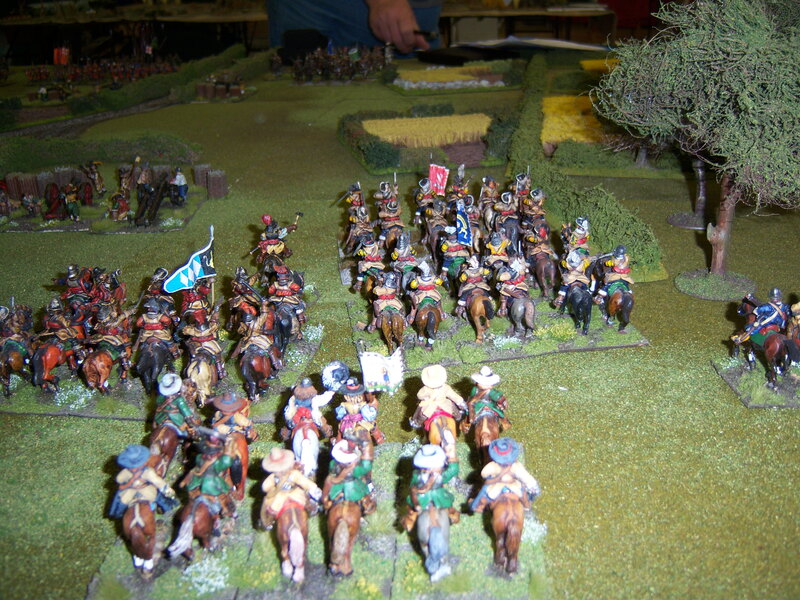 The Parliamentarian right wing cavalry advanced as did the Royalist right wing cavalry, up to support the artillery. End of turn card stopped any thoughts of any other moves. 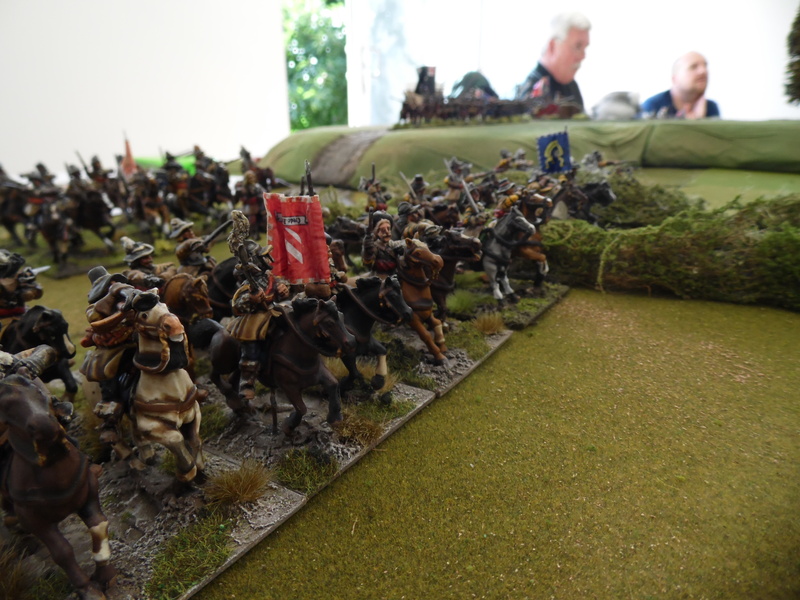 Both armies cavalry were lucky and their cards came out soon. Both moved to within charge range for when they are next activated. 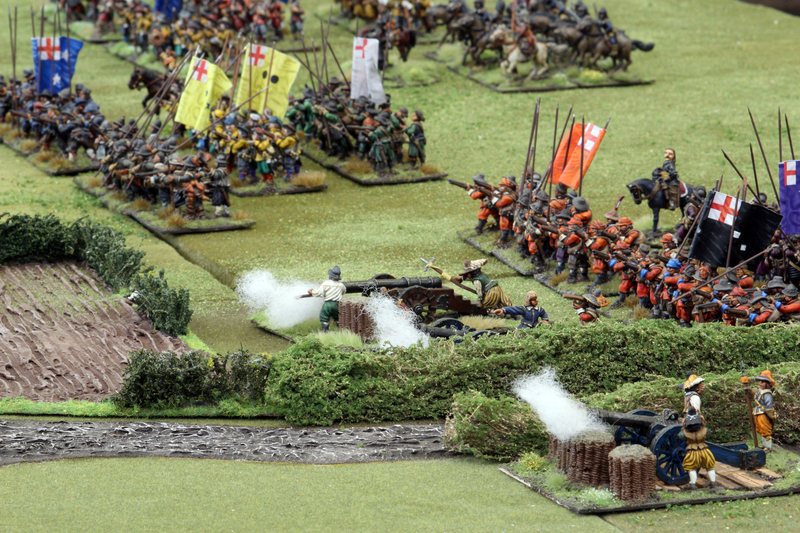 For now the artillery exchange shots. 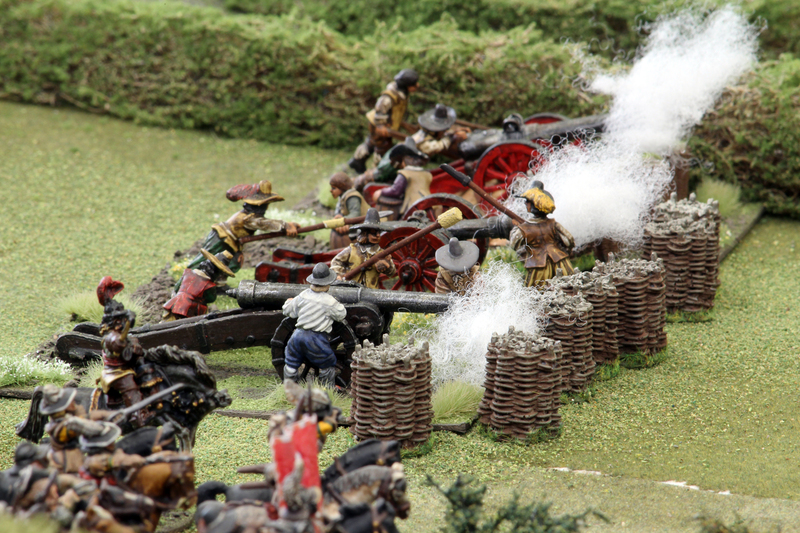 No real damaged except one crew of a Royalist gun became shaken. Then the event card came up………………… next artillery piece activated goes low on ammo. Royalist artillery was the next activated card. 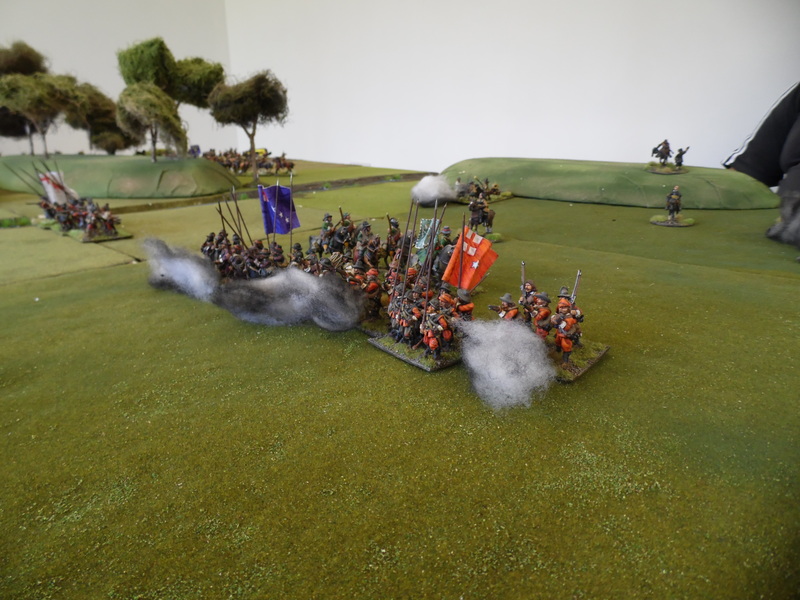 They fire at heavy cavalry to their right, causing a hit and with the unit failing a morale check they retired towards the rear. First real success to the Royalists. Both armies continue to move towards each other in the centre. Only the centre foot on both sides get activated. A fire fight starts. 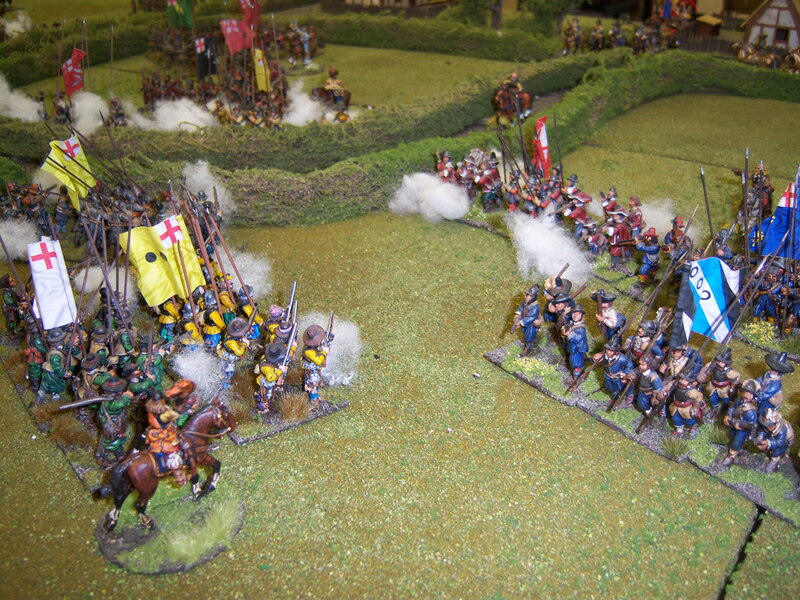 Confidence was growing on both sides with the cavalry chomping to get involved. 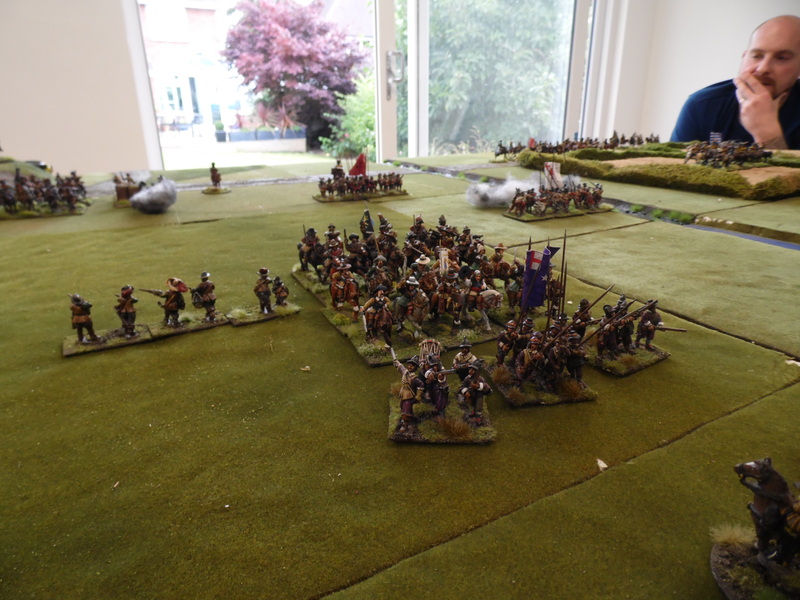 The infantry in the centre were all trying to advance to contact and casualties were starting to mount. 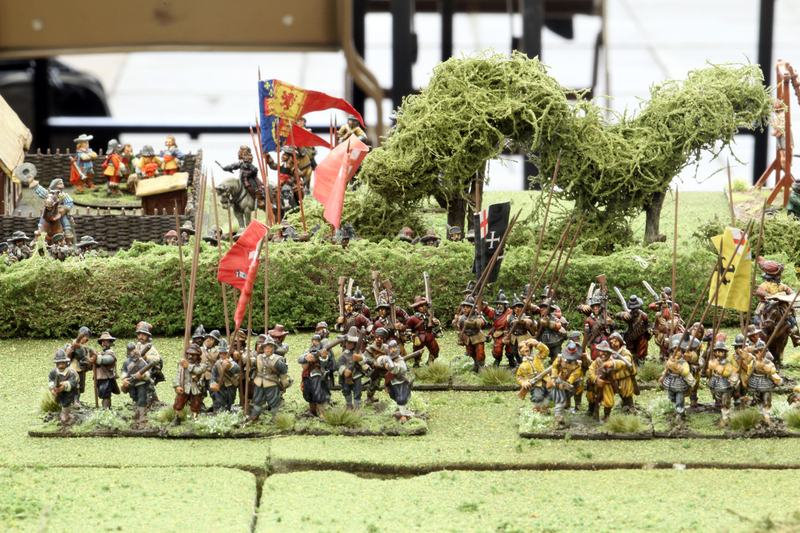 Prince Rupert sees his chance. 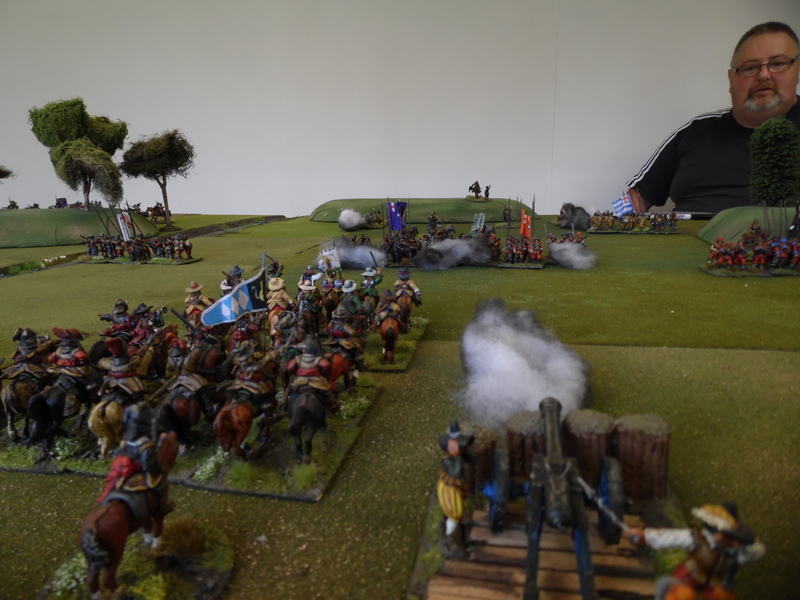 The artillery has softened up the cavalry for Rupert to charge. He just needs to be activated. Event card- next leader to be activated has slipped from the saddle and misses the turn. Next card, you guessed right, Prince Rupert. 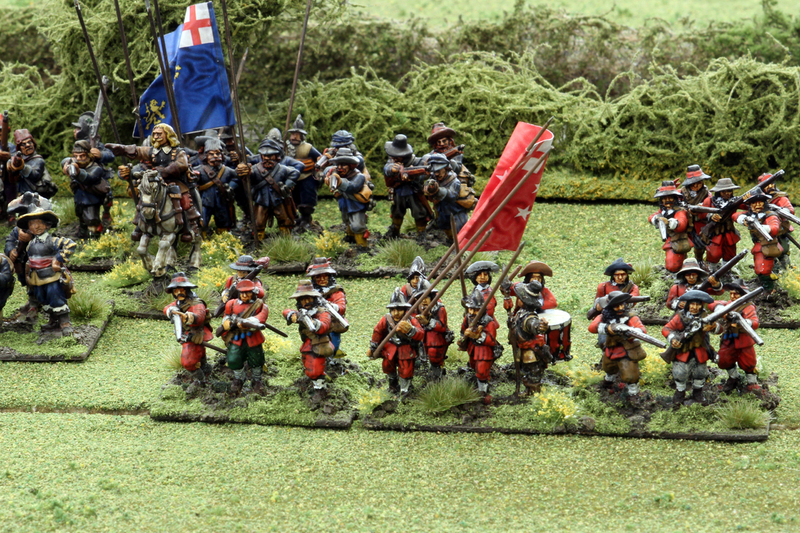 Infantry are now in melee, with the Royalists coming off slightly better. Parliamentarian right wing cavalry gets engaged. Rupert gets his chance. In he charges and inflicts enough hits for a morale check, they flee but Rupert checks his morale and does not follow up. Right wing looking good for the Royalists. 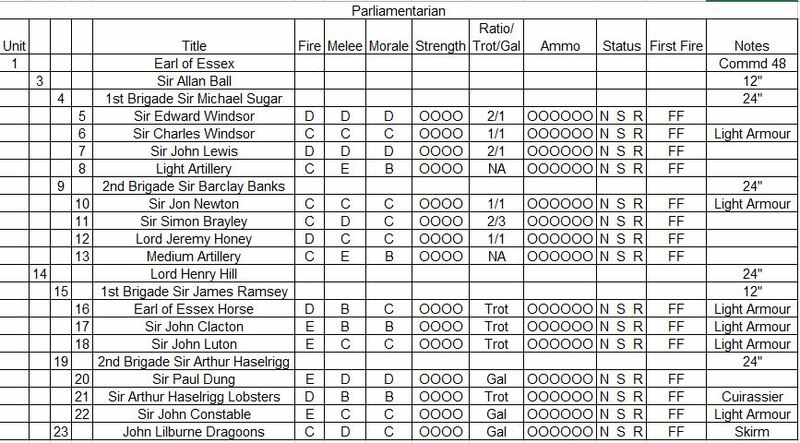 Parliamentarian right wing hits Royalists left but both fight out a draw. Royalist right wing victorious. 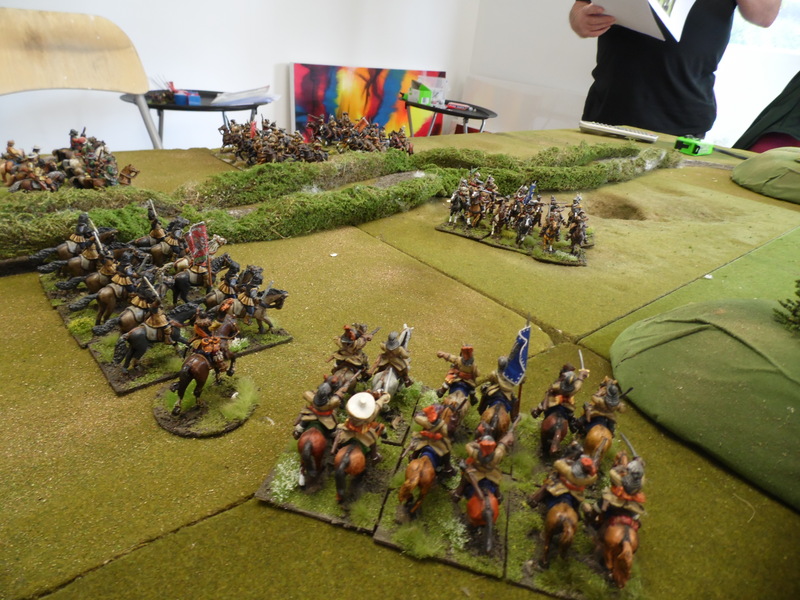 Royalist and Parliamentarian cavalry still slogging it out on other flank and infantry in centre starting to turn 90 degree as Royalist right win but left side fall back due to casualties. Due to the end of show this was the last turn. 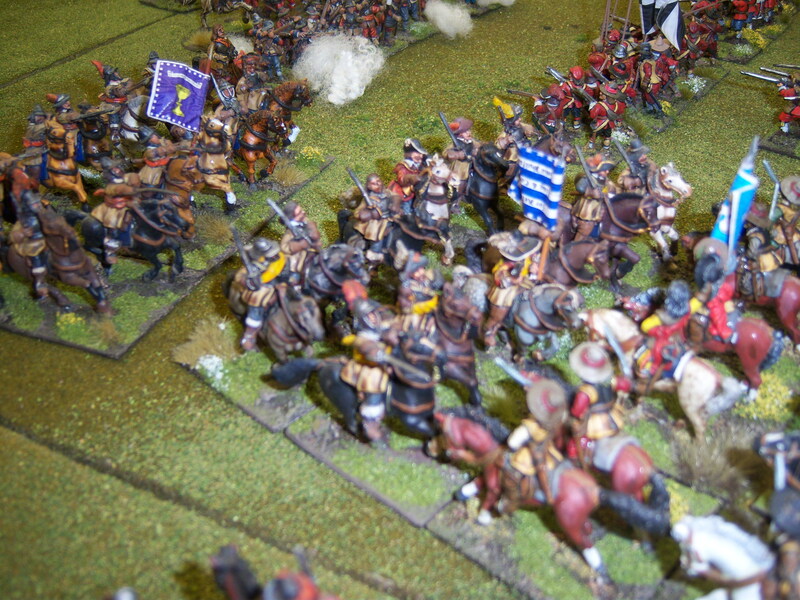 Mutually agreed that neither side had a decisive victory but Royalist would probably have held the ground. 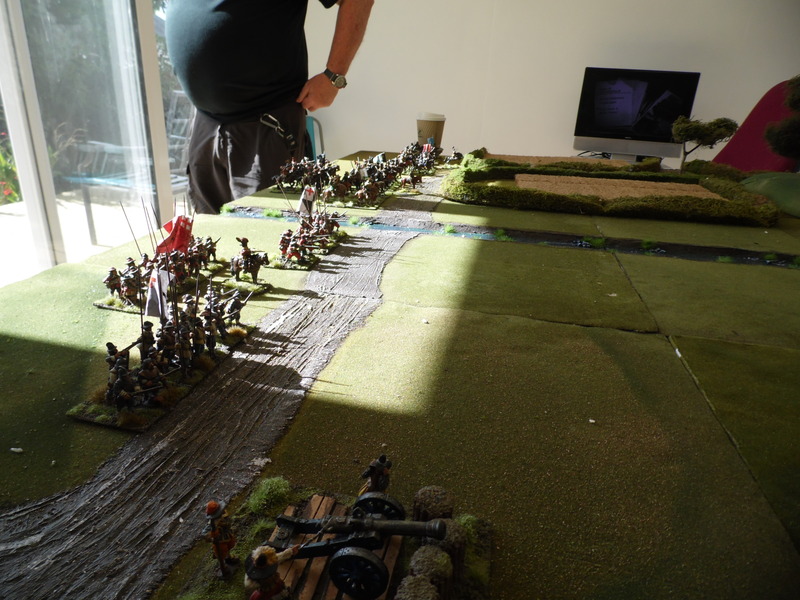 Everybody seemed to like the game and the rules raised a huge amount of excitement. I was very happy with it all. 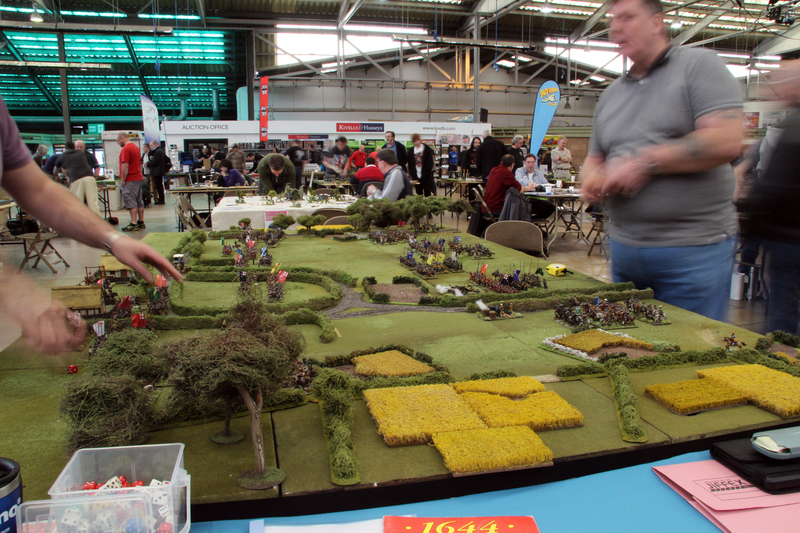 I loved the rules as they gave a great feel and with no casualty removal which were great for a demo. Please find below a selection of other shots from the day. Most of the photos are from the camera of Paul Davies. A big thank you. Hope you like them and I am already thinking about next year! I am thinking some sort of medieval battle but AWI might prevail. Sorry it has been a while since my last update. 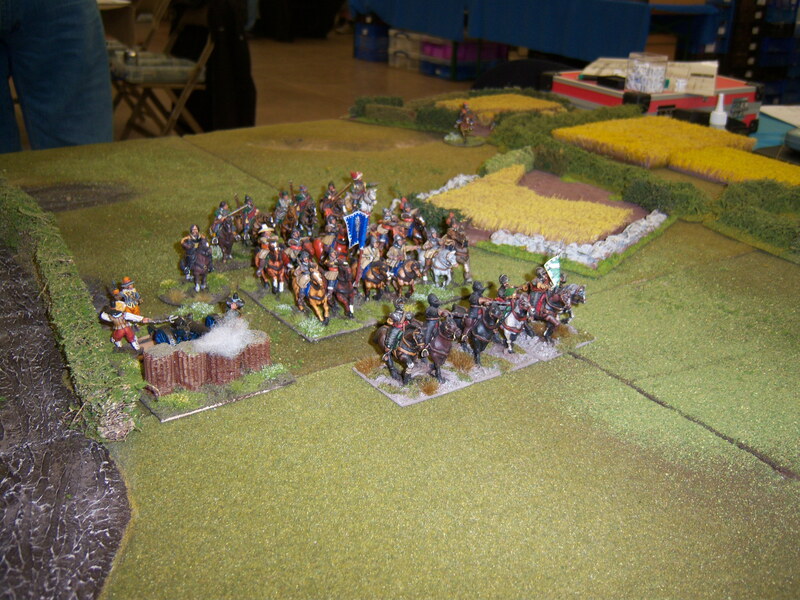 I have been busy preparing a game for my local show, Legionary in Exeter. 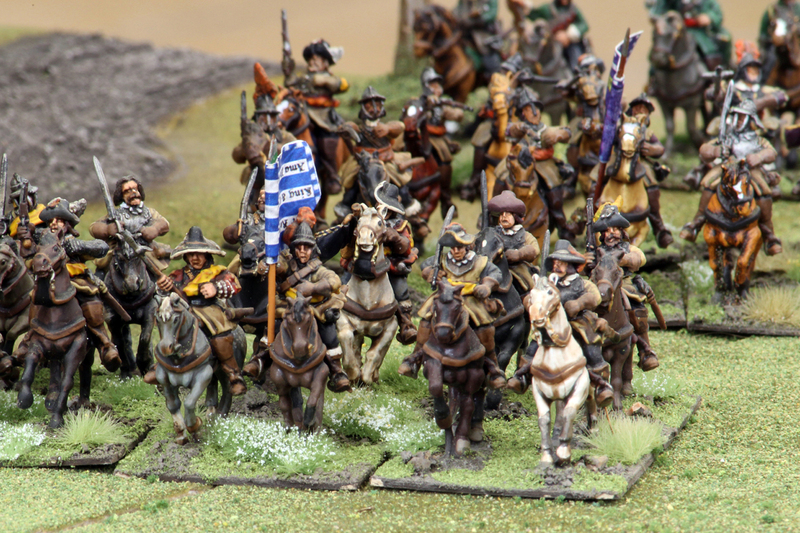 Link http://legionaryshow.co.uk/?page_id=70 please pop along if you can as it is a great little show on the way up. 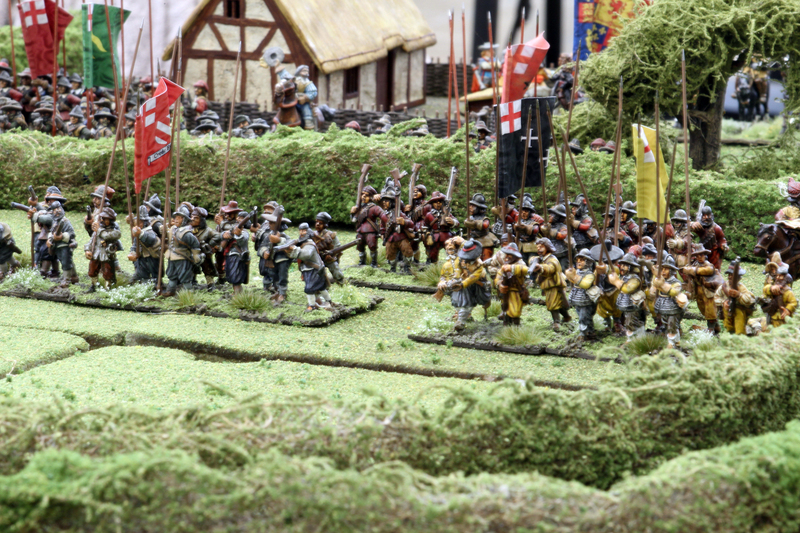 The game I decided to put on is a 28mm version of Edgehill. A bit ambitious when you are the only person with the collection. Once the show is over I will update you on the game with plenty of pictures etc. The rules I will be using is a set I discovered on the web and really like. They are called Victory Without Quarter (VWQ). 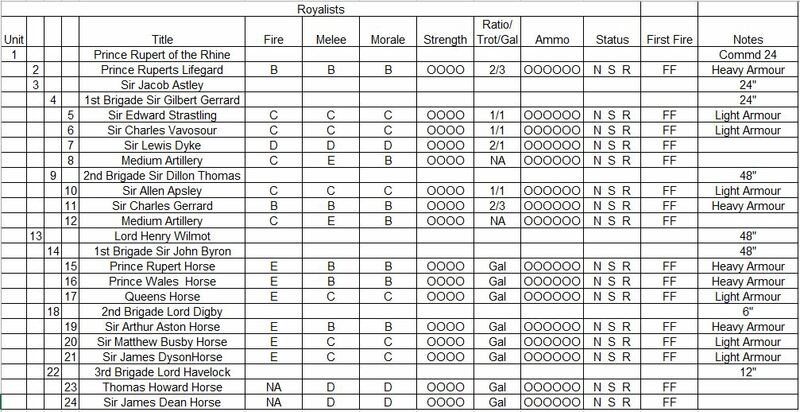 I will also be updating with quick reference sheets as well as a few local rule changes. That is it for now. 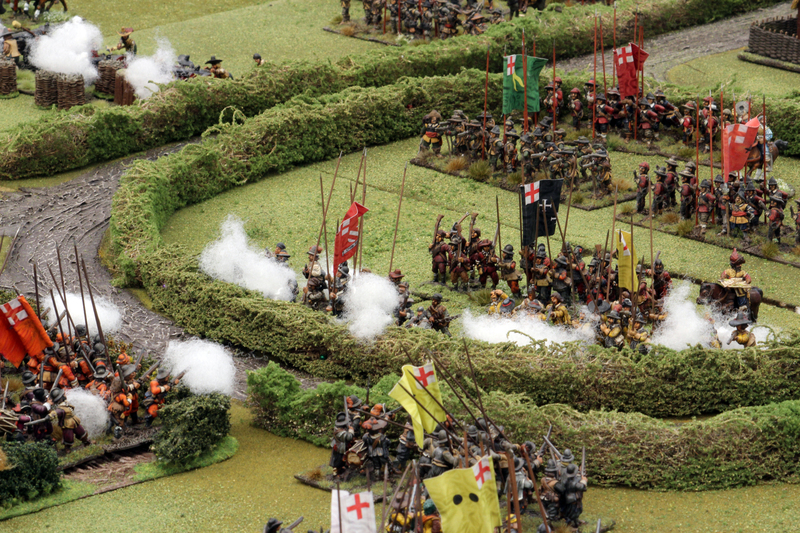 Back to basing……………..
Just over 3 weeks to go. Already thinking about next year’s game if people like this one. What will it be War of the Roses, Peninsula Napoleonic, Scottish Independence Wars, American War of Independence or World War II. More on these eras from me soon.